Thank you for visiting Oley’s Pizza and joining us in celebrating over 30 years of pizza making history! Oley’s was created and founded by Carol and Stephen (better known as Oley) Olinger. The family opened it's first pizzeria in Ossian, IN in August 1980, and since then we have achieved numerous local and national awards. After numerous visits to Chicago, Oley was the first person to bring his own take on Chicago style pizza to Fort Wayne. This is the invention that made us FAMOUS. Oley's pizza has stood the test of time by bringing you only the finest & freshest ingredients we can find to feed your FAMILY. However, our greatest achievement is seeing faithful customers, "FAMILY", returning year after year to join us in celebrating good food, good friends, and good times. Today the Olinger family continues to strive to carry on the great tradition started by Oley & Carol over 30 years ago. We are proud of making the healthiest, freshest, and best tasting pizza pie that is possible. We start with the freshest and most natural dough - made in the store twice daily - with four kinds of flour, natural honey, fresh yeast, and extra virgin olive oil. Then we top the crust with only the finest California vine-ripe tomatoes that we can buy. Our sauce is a blend of three types of tomatoes that are all fresh packed with no citric acid, add our special seasonings, extra virgin olive oil and fresh-grated parmesan & romano cheeses. Then comes the purest natural pizza toppings that we can find. For example, our signature In-House Italian sausage is brought in fresh daily from local meat merchants. We blend it with our secret seasonings and cook it to perfection. The pie is then ready for you to choose your other favorite toppings. Finally, of course, is the "Piece de Resistance" - Our Secret Four Cheese Blend. It is the envy of the pizza industry. First and foremost, we use only the best cheeses that we can purchase. Oley’s will never sacrifice our quality to save money! Our 100% all-natural Wisconsin Cheese Blend is grated fresh every day in-store. 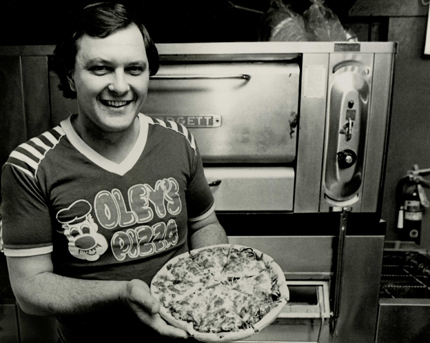 Oley's vow in 1980 was to bring to YOUR table the Purest, Finest, Freshest, and most "Naturale" pizza pie in the business. That vow has not changed in 30 years!